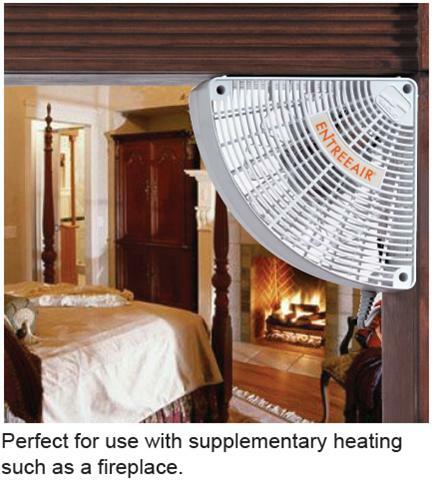 THE ENTREEAIR® DOOR FRAME FAN™ GENTLY CIRCULATES AIR FROM ROOM TO ROOM. The EntreeAir® is a safe, efficient and effective way to circulate warm or cool air from room to room and operates for pennies a day. 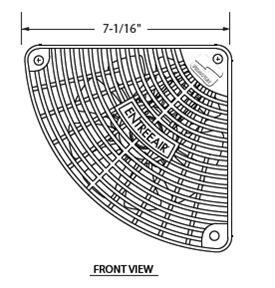 The EntreeAir® mounts easily into any door frame and works great in recreational vehicles as well. What will the EntréeAir do for me? The EntreeAir is designed to be mounted in a doorway and move air from one room to another. Why would I want to move air from one room to another? If you have a fireplace in one room, you may want to share some of that heat with an adjacent room in the winter. Similarly, if you have a window air conditioner in one room, you may want to blow some of that cooled air into an adjacent space. 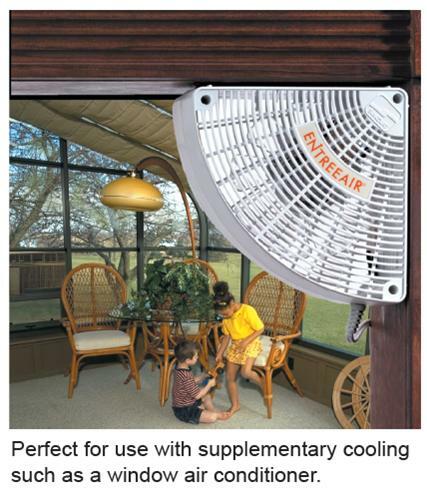 The EntreeAir is also very effective in maintaining some airflow into a room that seems stuffy. How much air does the EntreeAir move? The EntreeAir moves approximately 100 Cubic Feet of air per Minute (CFM). To put that in perspective, a 12' x 18' room contains about 1700 cubic feet of air. At 100 Cubic Feet per Minute, divide the room volume by the 100 CFM, which gives approximately 17. That means the entire air volume of that room is moved every 17 minutes. How much electricity does the EntreeAir use? The EntreeAir uses 27 Watts of electricity. Like a small light bulb. How do I install the EntreeAir? The EntreeAir mounts on the doorframe. There are keyhole slots in both straight sides of the unit. Simply install two screws in the doorframe and hang the EntreeAir with the keyhole slots over these screws. Can I control which direction the air flows? Yes, because the EntreeAir has two sets of keyhole slots, you can hang it blowing into or out of a room. How quiet is the EntreeAir? Very quiet. The sound level is 50dBA, about the same as the fan of a desktop computer. How long is the power cord? The power cord is 10 feet long and has an in-cord on/off switch. Can I close the door with an EntreeAir installed? Yes. The EntreeAir mounts beside the wood doorstop strip, opposite from when the door closes against. How do I clean my EntreeAir? Your EntreeAir will accumulate some dust over the years. Simply blow out that dust occasionally or use a small brush or cotton swabs to clean the interior. Never open the housing of your EntreeAir. This will void the warranty and constitutes a serious safety hazard. Operating the EntreeAir in a clean household and changing the filter of your central air system regularly will help keep the EntreeAir clean. Can I run the EntreeAir continuously? Yes, the electric motor is designed for many years of continuous operation. Is the EntreeAir safe? Yes. Conforms to ANSI/UL Standard 507 & Certified to CSA C22.2 No. 113. The housing is made of a flame retardant ABS material. The electric motor is a Class B, Thermally Protected motor.